The electric COPO Camaro made a splash at the SEMA Show last month as part of COPO’s 50th-anniversary celebration, giving a peek at COPO’s potential future. 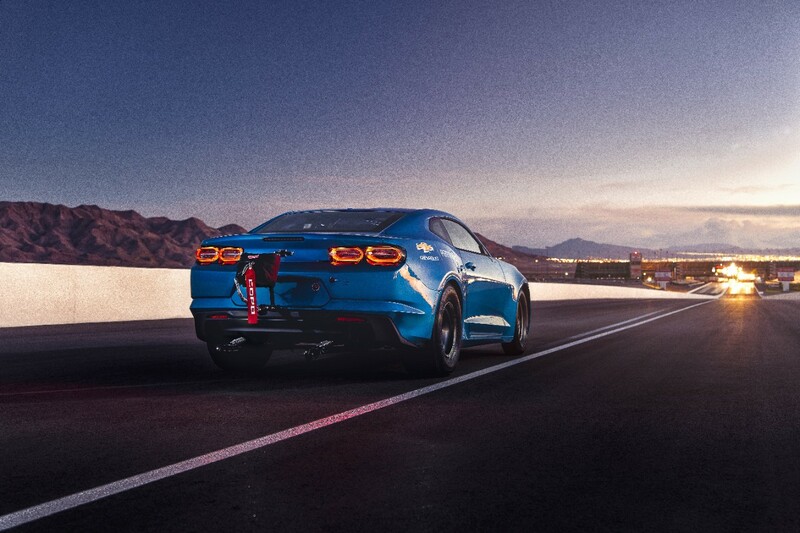 The electric Camaro drag car sports GM’s first 800-volt battery pack, producing an astounding 720 horsepower and 630 pound-feet of torque. YouTube channel 1320Video was able to interview Russ O’Blenes, the director of performance parts and motorsports at General Motors, about the special Chevrolet Camaro. He dished some juicy details about the car and what the technology holds for the future. According to O’Blenes, the goal of COPO now, after receiving great response from the show, is to see how an electric performance package could be delivered to customers just like GM’s other crate engines if executives in Detroit approve. One of the hurdles is safety. O’Blenes explains how gasoline is dangerous; however, we’ve learned how to handle the combustible chemical. That same familiarity isn’t there for electrified powertrains, which have their own dangers. O’Blenes adds GM must be able to offer the EV powertrain in a safe package. O’Blenes estimated the electric COPO Camaro could run the quarter-mile race in the high nine-second range. That’s with the 700-pound battery packs and 300-pound motor assembly. The electric COPO Camaro tips the scales at 3,480 pounds—or about 250 pounds heavier than a gasoline-powered Camaro. COPO made the electric powertrain modular, too. This would allow GM and COPO to sell EV powertrain upgrades to a host of customers who want a wide range of performance options. A classic Chevy hot road does not need 720 horsepower on tap. The modularity of the system provides options. For example, the electric COPO Camaro has four battery modules—two in the trunk and two in the back seat—allowing them to fit anywhere in a vehicle. Electric vehicles are the future of automobile propulsion. It may be years before fully electric vehicles take over; however, hybrids will help bridge that gap. GM understands the future that is coming and is preparing to offer high-performance electric cars, too. You can’t be upset at having 630 lb-ft of torque available at 1 rpm. That translates into an insane level of performance. Just copying what Tesla did more than 10 years ago. Yeah, but Tesla was just copying what GM did 16 years before that with the EV1, and it’s “A Shot Across The Bow Of Tesla” none the less! And it’s the “e”COPO Camaro! We need this put into an all wheel drive. No better time for an electric Cyclone for the soccer mom and a Typhoon for pop’s. So he can “Take A Shot Across The Bow Of Tesla” and bury the hype on his way to the hardware store! Yeah but Elon put his balls on the chopping block and got her done while building a car that people really want to buy. GM shredded all the EV1s that people loved and continued to build horrible cheap appliances. You snooze, you loose. Now Elon wants to buy GM shuttered factories for a few pennies on the dollar. With your money, and GM should say NO, pay up, with your customers money! Some people like iPhones to!